What's my site adress and can I change it? I purchased my site address elsewhere - what do I do now? What's my site address and can I change it? When you press button "Publish", you will see a window with your website address. If you want to change default site address, press Enable premium. You can collect a domain for 0$. Do it here. Hosting is a place on a server when we store your website's files. Unlimited hosting in WebWave website builder is free and linked with many important features, which will make publishing your website a piece of cake. No need to worry about technical issues, we have got this. Website domain is your site address, which means that as long as you pay for your domain name, you are the only one who can have a website under this site address. Domains can have different endings e.g. your-website.com or your-website.eu etc. The full list of domains you will find on Domain. For Premium Plan and domain you need to pay separately. Find out more. 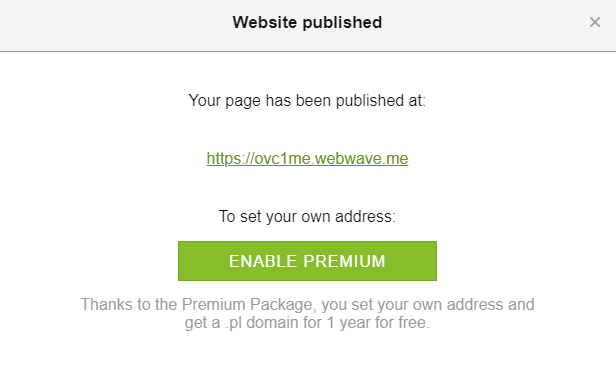 With WebWave you get a free domain for a whole year. All you need to do is subscribe to the annual cycle of Premium Plan and register your domain name. Read more about this offer. If you already have your side address bought from a third party provider, you can easily connect it to a website build in WebWave website builder. More information about settings you will find in our guide How to link a domain to my website in WebWave knowledge base.